I’d like to talk a bit about how we template our cards and why it matters. I’ll also talk about an important example from The Red Dragon Inn. So, what is “templating”? 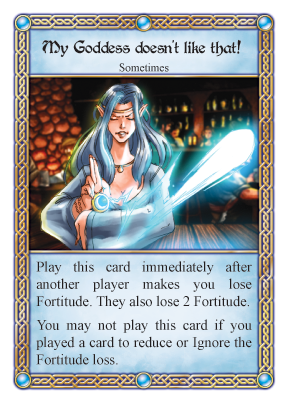 Well, in most card games that have text on the cards, the designers make some efforts toward consistency when wording the cards. Specifically, if two cards are meant to function the same way, they are worded the same way. 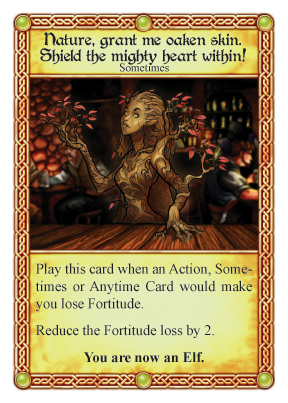 The converse of this is where consistent templating can be very helpful: if two cards are worded differently, it is because the game designers intend for the cards to function differently. A quick sidenote: OK, we’ll admit it. We weren’t as careful about this in the early days as we are now. For example, in first and second editions of RDI 1, there are examples of cards that are worded differently that are actually meant to function identically to each other. So, when following along with this blog post, please imagine that your RDI cards use the updated wording that we started using with the 3rd edition of RDI 1, the 2nd edition of RDI 2, or any edition of RDI 3. Here’s an example where templating helped us clarify a source of potential confusion in the RDI rules. There are two particular types of Sometimes cards which can respond to you getting hit by another player: those that affect the damage before it happens, and those that let you hit the player back after it happens. We decided to use templating to our advantage for these cards. The key difference is in the phrases would and immediately after. would: a card has been played, but has not yet resolved, which will make some event happen. immediately after: a card has just resolved and made some event happen. Our intent here is to communicate to players that if you want to reduce damage, you have to do so before the damage resolves. If you want to hit someone back, you must wait until after the damage happens. More specifically, we wanted to make it clear that you can’t weasel out of damage AND hit someone back. Expect to see more of our good friends “would” and “immediately after” in future editions of RDI. Until next time, SlugFest rules! Got a question about this or any other aspect of SlugFest’s rules? Leave a comment here, or email us!